POWER WHEY COMPLEX™, with its distinctive three-tiered enzyme fortified protein blend, helps nourish your body and feed your muscles with a concentrated dose of nitrogen-rich protein. 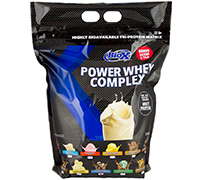 Plus, Power Whey Complex undergoes a unique instantization process so you can enjoy a smooth and delicious lump free shake. At a lactose level of under 5% (less than 2 grams per serving), Power Whey Complex is easily tolerated by most individuals. Power Whey Complex contains only 100% pure whey protein and the best flavouring components around to deliver the best-tasting whey protein supplement you will ever try! 25-27 grams of an easily dispersable, highly bioavailable Tri-Pro protein matrix. Fortified with Powerzyme, our digestive enzyme complex including the patented protein digesting enzyme: Aminogen. 9 (and counting!) amazing flavours formulated using the latest and most advanced flavouring technology. Ingredients: Power Pro™ (Our unique protein blend consisting of: cross flow microfiltered and ultrafiltered whey protein concentrate, cross flow microfiltered, ultrafiltered and diafiltered whey protein isolate, partially enzymatically hydrolyzed whey protein), Dutch cocoa powder, fructose, natural flavour, Powerzyme™ (Proprietary protein and carbohydrate digestive enzyme complex consisting of: Aminogen* , bromelain and lactase), xanthan food gum, sucralose, carrageenan, salt. 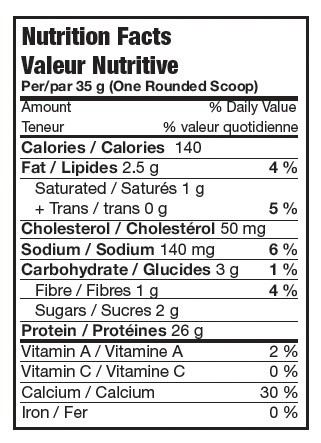 Note: Values and ingredients may be slightly different depending on flavour.